In the other three Gospels clearing the temple is at the end of Jesus’ ministry, but in John’s Gospel it’s at the beginning. Some think it may have happened twice, but no one is really sure. In any case it’s an important event for all Christians. Look at verse 13. At Passover all Jewish males were required to go to Jerusalem to sacrifice a lamb and commemorate how God delivered them from slavery in Egypt. As we already saw in chapter 1, Jesus came to become the Lamb of God who takes away the sin of the world (1:29). What he does in today’s passage sets in motion the working out of that ultimate event. Look at verse 14. Here, “the temple courts” means specifically the Court of the Gentiles. It was the outermost court where non-Jewish people were welcome to come and seek and worship God. But in this very place, merchants had set up shop. It shows that God’s people were not really interested in helping others come to God. They were more interested in shopping, saving money and feeling convenient. By being able to buy their sacrifice animals right there on the temple grounds and exchange their foreign money, they were trying to make their worship easier. But really worshiping God isn’t about our ease or convenience. Worshiping God is about giving our hearts. What they were doing there shows they had little interest in God’s purpose or God’s heart to reach those who don’t know him. Their so-called worship wasn’t really for God, but for themselves. What did Jesus do? Read verses 15,16. Jesus was mad! But he wasn’t out of control; his anger had a purpose. He was making a dramatic statement to teach an important truth. The Jerusalem temple, Jesus says, is his Father’s house. What does he mean? Simply he means it’s God’s dwelling place. As such, it’s meant to be a holy place, because God himself is holy. But when Jesus got there, he found it full of cattle, sheep and doves and people exchanging money. It was a market. It was not a place where people could focus on God. It was too noisy and smelly. In brief, it wasn’t a place of reverence for God. So Jesus drove these merchants and their animals and money out of the temple courts. They should have been selling those sacrifice animals somewhere else nearby, not in God’s house. It’s not just an old story for the Jews. The Bible calls all Christians to worship God acceptably with reverence and awe (Heb12:28). But wherever we are, if our minds are distracted and our hearts are hardened or divided, we can’t do that (cf. Ps86:11; Eze11:19). When we attend Sunday services, we need one single, pure purpose: to worship God. We do it not merely with our lips or outward actions but with our hearts. Jesus who saw what was really going on in the temple can see right into our hearts. He’s challenging the quality of our corporate worship. Are we serious when we come to church? Are we giving our whole hearts? Or are our worship services superficial? Are we just satisfied with our outward attendance? Do we attend only when we feel like it? Or only if it’s convenient? Do we make church a place mainly where we can be comfortable, with coffee, good feelings and friends? If we’re thinking church is a place where I can get various kinds of personal benefits, we should revise our way of thinking. We should be thinking of church as a place where I can give myself to God fully. But when he says, “Stop turning my Father’s house into a market!” he’s also challenging our inner lives. How is that so? 1 Corinthians 3:16 says, “Don’t you know that you yourselves are God’s temple and that God’s Spirit dwells in your midst?” It’s not about a building; it’s about people. And 1 Corinthians 6:19a says, “Do you not know that your bodies are temples of the Holy Spirit, who is in you, whom you have received from God?” It’s a serious thing to be a temple of the Holy Spirit. Do we really believe this about ourselves: I am a temple of the Holy Spirit? This truth also tells us that what we’re doing with our bodies directly affects our worship of God. What we’re allowing into our minds and hearts directly affects our worship of God. God is never fooled by a double life. Are we letting our minds and hearts become like a marketplace, full of animals and money? Or are we striving to keep our minds and hearts pure, reserved for God himself? But how can we ever keep our minds and hearts from being unholy and displeasing to God? Our human efforts won’t work. They may help for a while, but our sin will eventually come right back. We need inner cleansing by the blood of Jesus. Only the blood of Jesus can cleanse our guilty conscience (Heb9:14). Only the blood of Jesus can purify us from all sin and all unrighteousness (1Jn1:7,9). The blood of Jesus has God’s power in it to forgive and cleanse us. We may feel helpless about the sin within us, but there’s something we can do. We need to confess our sins to God and accept the blood of Jesus by faith (Ro3:25a). James 4:8 says, “Come near to God, and he will come near to you. Wash your hands, you sinners, and purify your hearts, you double-minded.” Only when we do that can we really worship God. 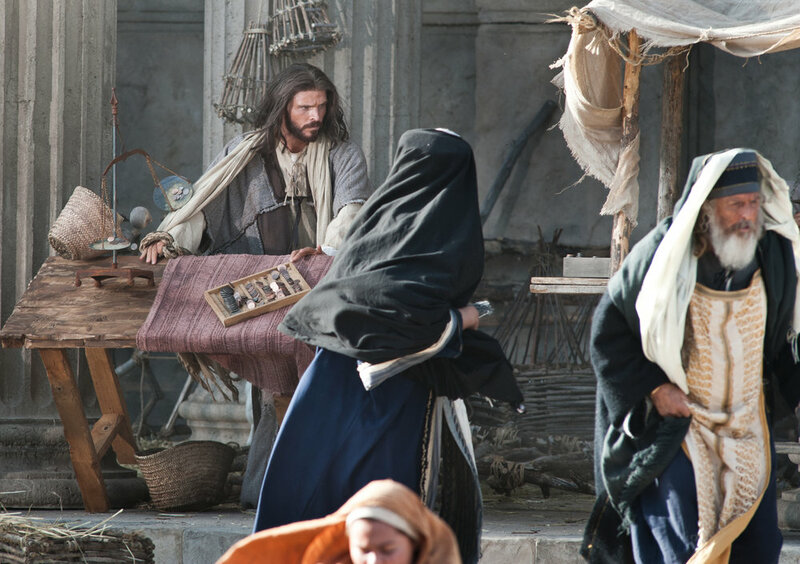 What Jesus just did in the Jerusalem temple was dangerous. He was challenging the entire Jewish religious system. He was calling out their hypocrisy. And he’d just started his ministry. It didn’t seem like a wise thing to do. His disciples might have freaked out. But how did they respond? Read verse 17. The disciples didn’t get emotional; they tried to understand him based on Scripture. They saw what he was doing positively, not negatively. They understood his heart, his zeal for his Father’s house. We too need to try to understand things based not on our own thinking but based on the Bible. How did people respond when Jesus cleared the temple? Look at verse 18. They asked for a sign to prove his authority. Instead of admitting that he was right and they were wrong, they tried to challenge his authority. It’s typical of what we all do when we don’t want to repent. What did Jesus say? Read verse 19. Jesus wasn’t at all intimidated; he challenged them back. But the meaning of what he said wasn’t obvious. Look at verse 20. They thought he was talking about destroying the Jerusalem temple. It’s reconstruction had begun 46 years previously, under the rule of Herod the Great. They thought Jesus was boasting about something impossible, to rebuild that huge temple in three days. Read verse 21. Jesus was saying they would destroy his body, but he would be raised in three days. He was saying his death and resurrection are the miracle that give him all authority to do anything. Our Risen Lord Jesus is the one who has the true authority to rebuke and challenge anyone. He was also saying that through his death and resurrection he himself would become the temple for God’s people. Jesus fulfilled everything that the Jerusalem temple represented, and he actually made that old temple obsolete. What does it mean to us? It means we don’t have to go to some specific holy place or fancy building to worship God. We can worship God literally anywhere, when we really come to Jesus our true temple by faith. Whenever we really come to Jesus, we’re directly connected to the living God. Look at verse 22. It seems that at that time, even the disciples didn’t understand what Jesus was talking about. But after he was raised from the dead, they remembered what he said that day, and when they did, their faith in him grew and deepened. Real faith in Jesus isn’t based on miracles, but on Jesus’ words and the words of Scripture in the whole Bible. The author John continues to talk about this. Look at verse 23. It seemed that more and more people were believing in Jesus. But their belief was based on the miraculous signs he was performing. John doesn’t tell us what those signs were. He just says that people were satisfied with those signs. They didn’t delve any further to try to know him. How did Jesus see them? Read verses 24,25. Jesus didn’t trust these so-called believers. Why? Because he knew what was in them. What was in them? Sin. Miracles couldn’t change that. Seeing miracles didn’t lead them to repent. So they weren’t really committed to him. It also reinforces the meaning of Jesus’ clearing the temple. Jesus came not to just do miracles in our lives, but to change us from within. So let’s read verse 16b again: “Stop turning my Father’s house into a market!” Jesus was zealous, passionate, full of holy anger about this. Today people protest many things. There’s the “Me-too” movement, the “Black Lives Matter” movement, and many other social causes. People passionately protest about them, block traffic, chase down senators, and march in the streets. Surely our Lord Jesus is concerned about people who are unjustly abused or despised. But we don’t see any real movement of people today who are upset about the lack of true worship of God. We don’t see any real movement against superficial worship or hypocritical worship. People are just quiet about how God is treated. Of course, we live in a society where people are free to worship or not to worship. Unfortunately, many churches are not attracting those really seeking God. May God renew in us a fire for the true worship of God. May God help us repent of what we’ve been doing with our own hearts, minds and bodies. May God help us accept the blood of Jesus and renew a genuine desire to worship him. May God help us make our church services pleasing to him and a place where non-believers can come and actually encounter God.